The fall 2014 season is full of excellent anime—both new and returning ones. So while a few weeks back I recommended five new anime to watch, now it's time to look at the sequels, spin-offs, and remakes you should be watching right now. As with the previous article, guided by the readers of Ani-TAY, I have indulged in many of the most popular sequels, spin-offs, and remakes of the season—as well as a few others that just happened to catch my eye. 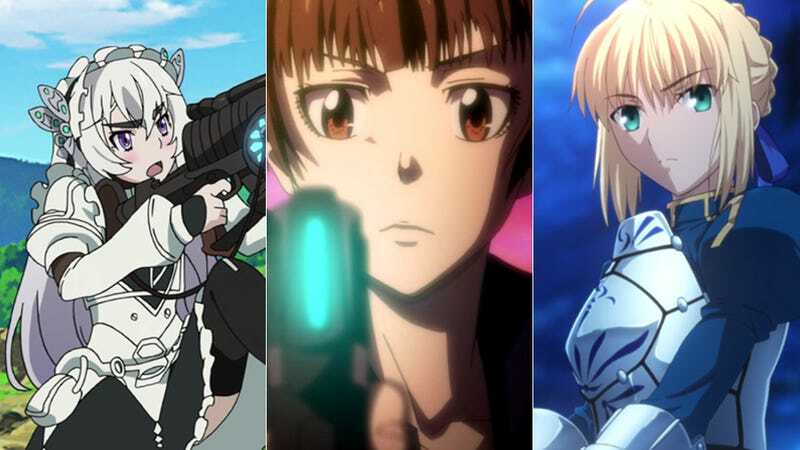 And, as always, keep in mind as you read that these are simply the anime sequels, spin-offs, and remakes that should not be missed this season. There are others airing currently that are perfectly watchable. These, however, are the cream of the crop. Non-Spoiler Plot Summary: Shiro Emiya is well-known as the handyman around his high school—able to fix almost anything because of his secret magical powers. Rin Tosaka is a model student at the same school and secretly heir of a dynasty of mages. However, while the two don't know each other, their fates become intertwined as both enter into a tournament to win the wish-granting Holy Grail—and are each paired with a legendary hero from a different time. Why You Should Watch It: An alternate retelling of 2006’s Fate/Stay Night, Unlimited Blade Works is a story filled with mysteries. Emiya is the perfect proxy character for the audience (by design as he is the player character in the original visual novel), and through his outsider eyes, we get a great look at the secret magical world that exists beside our own in a way easy for us to understand. The magic system in place is always intriguing in how it works and the anime’s characters are all unique and interesting in their own rights. However, the real show stealer for this one is the animation itself. Unlimited Blade Works looks unbelievable, especially for a TV anime. Out of battle, the animation is clear and detailed; and in battle, it is as fluid as it is beautiful—putting even prequel series Fate/Zero to shame. Non-Spoiler Plot Summary: In a world where people's psychological states are constantly scanned and those who fail to meet the requirements are arrested or killed, young police inspector Akane Tsunemori commands her own team of psychologically unstable “enforcers” to stop the violent criminals who threaten the peace. This season she is up against a new criminal mastermind who seemingly has the ability to make even the most brutal, violent killers cleanly pass psychological scans. Why You Should Watch It: Psycho Pass 2, is, if anything, more disturbing than the original. The calmness of the perpetrators when committing their acts of violence is frankly unnerving—especially in light of the brutality of their violence. The elaborate traps they set to psychologically break the innocent are horrible in both conception and execution. What’s even more unsettling is the idea that the criminals in this anime truly think they are doing good. Then on the other side is Akane, who knows she is working within a broken—likely dystopian—system but is trying to save all those she can. Of course, her uphill battle is even more difficult as those she works with question her capability as an inspector and occasionally her sanity. Non-Spoiler Plot Summary: Chaika—daughter of the deceased evil Emperor Gaz—and her friends—soldiers of fortune Toru and Akari—continue their quest to find and recover Chaika's father's magical remains. However, each step towards their goal brings revelations about not only the evil emperor's plans but also the secret history of Chaika herself. Why You Should Watch It: Chaika continues to be a fun, plot-driven fantasy with clever characters and tons of adventure to be had. It has an amazingly well-thought-out setting and explores what happens in a world where the evil emperor has been defeated, the heroes sent home, and those kingdoms once shattered attempt to make a place for themselves in the new order. However, like the first season, the main reason to watch this anime is Chaika herself. Despite the dark revelations she confronts, Chaika’s innocence and the general excitement with which she views even the most mundane of things make the anime a joy to watch. Non-Spoiler Plot Summary: Ginko is a Mushi-Shi, a researcher of sorts studying the spirits of the natural world that few people can even see. As he travels across feudal Japan, he encounters many of these spirits and tries to help the people who have become caught up with them. Why You Should Watch It: Mushi-shi is a rare breed of anime. Instead of a long, arching plot, each episode is a self-contained story. Moreover, the tone of each is that of a fairy tale—a normal person comes across something mystical and becomes unwittingly entangled. Thus, it is Ginko’s job to help them as best he can—though it is ultimately up to the other character as to what happens in the end. This framework allows for massive amounts of flexibility in the storytelling—much of the time Ginko is a background or supporting character. It really isn’t his story, but rather the story of all those he encounters. He is just the thread that ties it all together. It is also shockingly beautiful in its visuals of the spirits and nature itself and is worth watching on that basis alone. Non-Spoiler Plot Summary: While riding a space elevator for a training mission, cadet Bellri captures an unknown mobile suit and its pilot from a group of pirates. But oddly, no one can seem to even get the “G-Self” mobile suit to activate; Bellri, on the other hand, has no problems piloting it. And when the pirates attack his city in an attempt to retrieve the G-Self and its pilot, Bellri is dragged into an adventure where the lives of everyone he holds dear hang in the balance. Why You Should Watch It: From the writer/director of the original Gundam, Gundam Recognista in G feels like a blast from the past. Everything from the story to the characters feels like they were pulled straight out of the 80s. However, as it is being made now, it avoids many of that era’s greatest pitfalls and budget-saving techniques—no episodes full of naught but talking heads and stock footage in this one. It’s got action, interestingly quirky characters, and the perfect balance of lighthearted fun and life or death drama. Also, while taking place in the original Gundam timeline, Gundam Recognista in G takes place so long after all previous stories as to be nearly unrelated. Thus, it is a perfect watch for fans and newcomers alike. Now that you've read my recommendations for what anime sequels/spin-offs/remakes you should be watching this fall season, you may wonder why your favorite series is absent. There are four potential reasons: (1) I think it is terrible (or at least not quite as good as the five above); (2) it is the second/third/fourth season of an anime—and those are getting their own guide posted in the near future; (3) it is an anime continuing from last season; or (4) it simply didn’t cross my radar. Oh, and if you feel the need for even more anime to watch, be sure to check out the five anime of the summer season you should have watched and our picks for the top five anime of 2013.